With an exciting update of Zimbra 8.8, Zimbra email server has again marked a victorious imprint in email and messaging industry. The all-new version is loaded with lots of new features and benefits that might attract the tech watchers. Like always, ZCS launched Zimbra 8.8 for end users and technical decision makers who are in constant search of security, privacy and transparency through the open code, extensibility, accessibility on multiple devices along with the deployment flexibility. This update is built on these tangents and incorporates enhancements to improve the experiences of end-user and system admin. This post includes some of the newly introduced features in Zimbra 8.8 and their benefits. Click a user to start chatting. A user can add an emoji when the mood strikes. A user can add a new member to the chat or can even create a new contact group while choosing from the Chat sub-menu. A user can decide whether they want to display the offline buddy or not. A user can choose preferences from the chat sub-menu for several other options. Zimbra Drive is another added feature that allows users to host and manage file storage, synchronization, and sharing. As the user no longer requires to access third-party storage tools to sync and share documents, this results in enhanced data security. ActiveSync: Customers are allowed to access all Zimbra email server functionality seamlessly across all devices with the new updated mobile and desktop syncing services. Real-time Backup: Zimbra 8.8 guarantees no data loss during email back-up. For the very first time any provider availed solution in the market that natively enables real-time backup helping customers to reduce server space required for back-up by up to 50 percent. Hierarchical Storage Management (HSM): This feature allows the users to move archival data to lower cost S3-compatible storage services. This again saves up to 50 percent of storage space of users system. Delegated Admins: The new and improved feature of Zimbra 8.8 includes Delegated Admin module. This enhancement helps users to create a delegated admin with just a few clicks in a few minutes. This feature allows hosting providers and large enterprises to decentralize core admin functions meanwhile protecting the stability and security of enterprise platform. 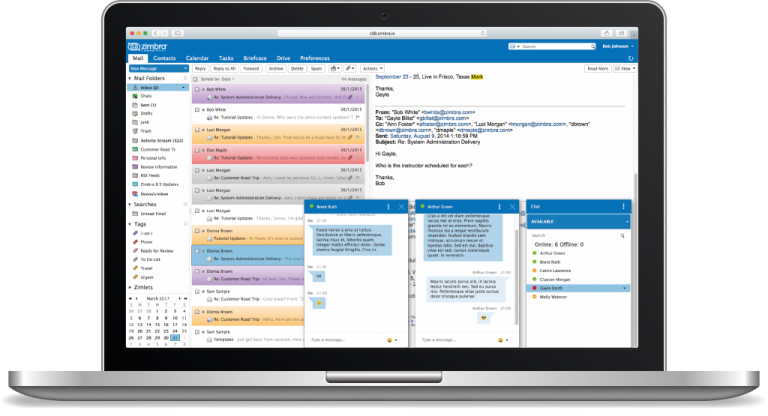 Zimbra email server has always been connecting people and information with unified collaboration software that includes email, calendaring, file sharing, chat and video chat. Zimbra email hosting can be deployed on-premise, in the cloud or even as a hybrid service. If you also wish to accelerate your business growth by connecting the world outside, the Zimbra email server is the right catalyst for you. You just need to contact i2k2 Networks, one of the most trusted email service provider with an experience of more than a decade in mailing domain and dedicated web hosting. We promise to deliver high-quality services and solutions to our clients beyond their expectations across multiple industries. Call us at +91-120-466 3031 | +91-971-177-4040 or drop an email at sales@i2k2.com. You can reach us even by filling out the contact form.